When Stockholm police officer Paul Hjelm shoots (and injures rather than kills) a hostage-taker he is hailed as a hero by the media but is not so popular with internal affairs who think his unofficial behaviour may encourage others. Instead of being sacked though, he is seconded to a new team, the A-Unit, a hand-picked team of detectives who are tasked with solving the murders of two top Swedish businessmen. They have more powers than the normal police and they can use the Swedish police to do their donkey work. THE BLINDED MAN follows the team's efforts to track down the serial killer and involves routine police-work during which the team begin to bond and the different personalities are revealed. Incidentally, SAPO, the security forces, are yet again (see Larsson, Tegenfalk) shown in a bad light as they jump to the conclusion that the deaths are the work of terrorist undermining Sweden's economy and go their own way. Despite being over ten years old (first published in Swedish in 1999) the storyline involving bankers, a depressed economy and immigration policies is very contemporary. 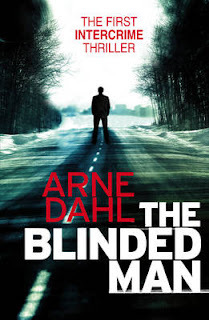 THE BLINDED MAN is a solid police procedural with a group of unusual police officers, from different regions of Sweden and different cultural backgrounds. The plot is well thought out and unusual though I found the pace did slow a bit in the middle. This was an enjoyable read with plenty of humour and I look forward to the next book, BAD BLOOD, in 2013. NB. THE BLINDED MAN was first published in English in the US under its original Swedish title MISTERIOSO. I enjoyed this book, too. I think it is a pity they changed the title for the UK as "misterioso" is a three-part clue. I agree there were some bits that did not work as well (eg the rationale for the crime) but on the whole I thought it very good and look forward to more.